Have you ever looked at some symbol tattoos and thought they looked really awesome but wondered if there was a meaning behind them? We wanted to take a look at four popular symbol tattoos and look into the deeper meaning behind them. 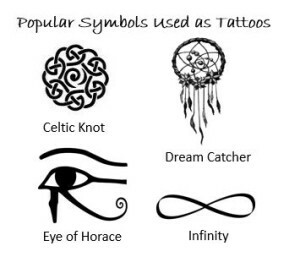 The infinity symbol, the Celtic endless knot, the dream catcher and the Eye of Horace are very popular and have some inspirational meanings behind them. The Celtic Endless Knot is the inspiration for the Bling Tattoos symbol so that is one of the first ones we decided to do some research on. Celtic Endless Knot– The Celtic knot symbol, is also referred to as the mystic knot, or the endless knot. The more esoteric or spiritual meaning of this symbol alludes to beginnings and endings. In viewing these beautiful knots, we cannot see a beginning or an end, and therefore we are reminded of the timeless nature of our spirit. A less spiritual representation is also related to the knots endless nature. Due to its infinite path, the Celtic knot can represent an uninterrupted life cycle. Some may use this symbol as a charm of sorts – warding against sickness or setbacks that might interfere with an otherwise calm and stable life. In this vein, in ancient times, gifts adorned with mystic knots would be given with best wishes of longevity, or luck with new endeavors. Infinity – Infinity (symbol: ∞) is an abstract concept describing something without any limit. The infinity sign, the figure of eight, and the mathematical lemniscate all refer to the same shape that contains a wealth of complex meaning within its fluid lines — because the circles of the lemniscate sit side by side, the sign implies equality between these opposing forces, with the connecting point in the center the convergent point. The sign epitomizes the idea of “two becoming one.” The infinity sign stands for wholeness and completion.The symbol is often used romantically to represent eternal love. Several types of jewelry are fashioned into the infinity shape for this purpose. Dream Catcher – A dream catcher is usually made up of a small hoop containing a horsehair mesh, or a similar construction of string or yarn, decorated with feathers and beads. Native Americans believe that the night air is littered with both good and bad dreams. The dream catcher when hung over or near your bed swinging freely in the air catches the dreams as they flow by. The good dreams know how to pass through the dream catcher, slipping through the outer holes and slide down the soft feathers so gently that many times the sleeper does not know that he/she is dreaming. The bad dreams not knowing the way get tangled in the dream catcher and perish with the first light of the new day. They are usually beautiful no matter how simple the design. The Eye of Horace – The Eye of Horus is an ancient Egyptian symbol of protection, royal power and good health. The eye is personified in the goddess Wadjet. Egyptian myth leads us to believe that the eye was not the passive organ of sight but more in fact an agent of action, protection or wrath. The sun is believed to be synonymous to the eye, symbolically, so too is Horus the all seeing one. The meaning can vary greatly as hieroglyphs are interpreted differently across the cultures however in jewelry, symbolism usually leans toward protection, good health, and power. So, now next time you see someone wearing one of these symbols whether it be in tattoo form or in jewelry you will know the meaning behind it. You might be able to guess a little something about that person without even saying a word to each other! If you want to try one of these symbols they can be found in some of our Bling Temporary Jewelry Tattoo Collections. Bling temporary jewelry tattoo collections have various fun themes. From Henna inspired to Island Beauty to bold Tribal designs you are sure to find one to match your style.